That experience was so moving, that I've vowed to go out of my way to repeat the experience. My next opportunity, in planning stage, is to combine three bucket list items in one. 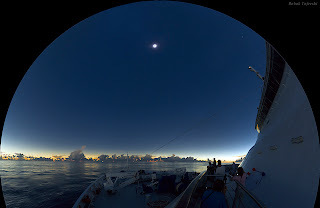 Beside unlimited solar eclipses, I want to experience at least one ocean cruise, and I want to return to Australia (where I spent two weeks on business in 1992, but had little time for touring). Well, there's an opportunity for all three in one on Nov. 14, 2012 off the east coast of Australia, near Port Townsend and Cairns (prime tourist territory). Looking forward to it! On the longer term, there's a great opportunity to view a total solar eclipse in the US mainland on August 21, 2017. See this link for a map of the path, which crosses Oregon, Idaho, Nebraska, Missouri, Tennessee, and South Carolina.